We often get an email that the service isn’t moving any files. After asking some more feedback about the issue we often get the following reply. Yes and we understand why it isn’t working. Let us explain. The LimagitoX service does not know about the mapped drive letters that you are using as a logged on (desktop) user. Even when the logon as user for the LimagitoX service is the same as the one you are logged on with (they are both using a different session). If you want to use drive letters with the LimagitoX service then you need to add them using our Network Drive option (Tools menu => Network Drive). 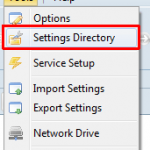 First unmap them in Windows then map them again using this option. The service will then also map the drive letters at startup in it’s own session. The following information applies to LimagitoX and LimagitoXI (not for the newer versions like v2017 and higher). 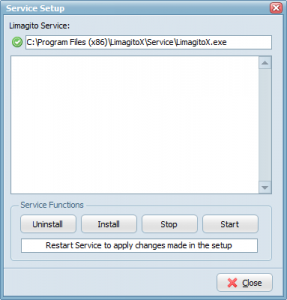 After setup you’ll find two versions of LimagitoX in it’s install directory. An application version (= LimagitoX.exe) and a service version (= Service\LimagitoX.exe). You can run the application version without the service version. The service version isn’t needed when using our File Mover as an application. Settings will be saved in a SQLite database. 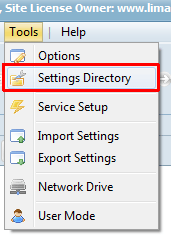 You can find this database and all other configuration files under the ‘Settings directory’ menu item. A backup of this folder is all you need in cas of recovery. You can run the service version without the application version. You only need the application version as a setup tool for the service. Install the service once (do not uninstall/install with every update). 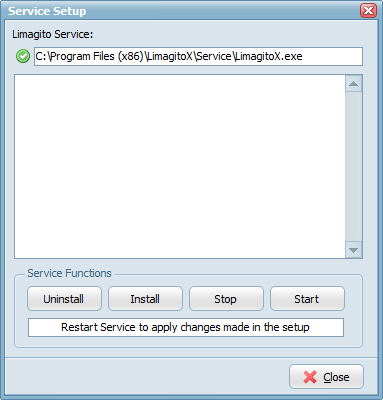 Use the Service Setup tool within LimagitoX to control the Service. You need to change the default logon as user of the service with a user that has sufficient rights (network, share, …). You’ll need to restart service every time you change something in the setup. The service version will share it’s settings database with the application version. Please close the application version when you’re done. It’s not a good idea to let them both run. When you open the the application version and the LimagitoX service is already running then it will set the status of all moving rules in the application version to ‘Rule Enabled & Not Scanning’. We don’t want the application version to interfere with the running LimagitoX service. If you want to know what the service is doing then please to enable the built-in HTTP server (Server Menu => HTTP Server). When the server is enabled you can connect to it’s webpage (default http://127.0.0.1:8080 ) and check the runtime log of the LimagitoX service.